Apartment Mariano is located in a residential complex constructed during the end of the 19th century. This complex, recently renovated, is now a vacation rental. It is centrally located, in the heart of Florence City, on the banks of River Arno, close to the Duomo of Florence, one of the most well-known Cathedrals in Italy. The main railway station at Santa Maria Novella, is just 5 minutes from the apartment. The apartment has an elevator, and guests can avail the services of a porter at the rental apartment building, daily. Apartment Mariano is located in the third floor. 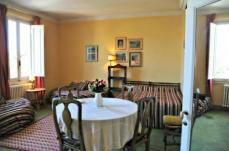 It is fully air-conditioned and tastefully furnished. It is spread over an area of 90 sq. meters. It has 4 rooms and has provisions to accommodate 6 guests. The apartment has an entrance hall with a dining area and a fully-equipped kitchen corner, a spacious sitting room that faces the Arno River, and 2 bedrooms- 1 double bedroom with a matrimonial bed and 1 double bedroom with twin beds. There are 2 bathrooms with shower cubicles. All the rooms in this rental apartment are spacious and have wide windows, offering the quests a lovely view of Florence city, and making the apartment bright and airy. The sitting room opens on to a balcony that overlooks River Arno, a stunning view with the numerous church steeples in the back ground. The rooms are beautifully furnished, with colorful paintings and chandeliers, making the guests’ stay a memorable occasion. 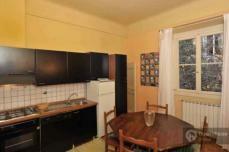 Other facilities the apartment offers are:television, washing machine, oven, bed linen, towels,and final cleaning. Great attention has been paid to the furniture and to the maintenance of the apartment. Apartment Mariano is situated close to many tourist spots, ideal for Italy tours; the famous old Bridge, the Fortezza Da Basso where popular art exhibitions are held and other renowned landmarks are within walking distance from the apartment. 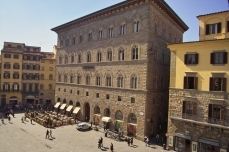 Florence was the birth place of the Italian Renaissance. Michelangelo, Leonardo da Vinci and Dante Alighieri, renowned architects and artists, were Tuscan born. The city of Pisa is close to Florence , and here you have the Leaning Tower of Pisa, one of the 7 wonders of the ancient world that attracts millions of international tourists annually. The Piazza dei Miracoli, also known as the Field of Miracles, houses some of Pisa’s most historical buildings and has been declared an UNESCO World Heritage site. While vacationing at Florence, tourists can embark on sight-seeing tours of Tuscany, to enjoy the unbelievable beauty of this region and its numerous renowned works of art and architecture.